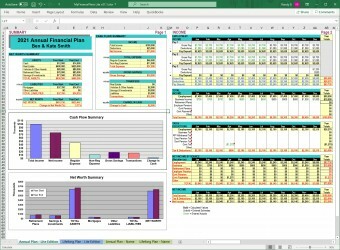 The MyFinancePlans Lite Edition personal finance spreadsheet template provides the most commonly needed features balanced against ease of use. It is suitable for most people and for most personal finance situations. 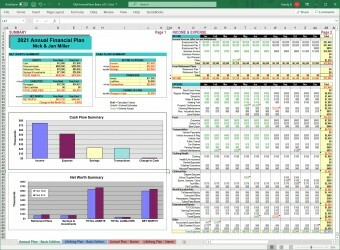 The Lite Edition includes a 7 page Annual Plan, a 6 page Lifelong Plan, and the User Guide. 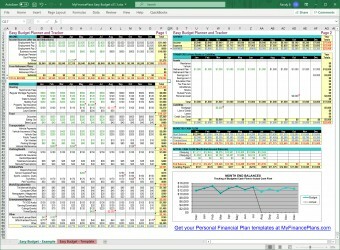 The MyFinancePlans Lite Edition personal finance spreadsheet template includes the most needed features and is easy to use. It is suitable for most people and for most personal finance situations. It provides more features and flexibility than the basic edition, including better income and expense handling, handling of CPI (inflation), present worth of future amounts, and easy adjustment of income/expense indexing and savings/investment returns. In the Lite Edition the Annual Plan is 7 pages long and the Lifelong Plan is 6 pages long with more features than the Basic edition and less than the Full edition. For a detailed comparison of the features of the Basic, Lite and Full editions of MyFinancePlans click on the Compare Plan Features tab above. Obtain your copy of the Lite Edition by clicking on the Add To Cart button and checking out. Payment will be made through PayPal to ensure security. You may use a credit card or other payment method. A PayPal account is not required if you don't have/want one. Immediately following your order an email message will be sent to you with a download link in it. Open this email message and click on the link to download the zip file to your computer. Then find the zip file on your computer and unzip it using Windows or any Zip program to access the files within. Open the spreadsheet file with Microsoft Excel 2003 or newer, or any compatible spreadsheet program. Open the User Guide with Adobe Reader or any PDF viewer program.